Here’s an unusual and easy to grow perennial to add to your home garden. Yucca includes more than 40 species of these tough succulents that have the look of plants native to a desert environment. Their appearance makes them ideal for inclusion into your rock gardens. They work well in beds that are “mulched” with small stones and sand, and can be combined with other distinctive succulents such as cactus. Or, they can be used as stand-alone specimens on their own or to anchor a corner of an established bed consisting of various kinds of plants (ideally, evergreen perennials). Yucca are native to North America and occur in parts of Central America and the Caribbean. And while they do have the appearance of plants found in warm dry desert areas, they will also thrive in colder climates of the United States and into parts of Canada. 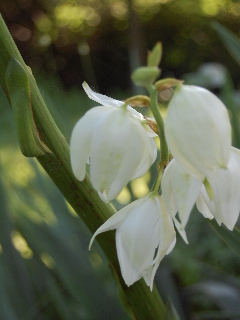 Yucca flowers are pollinated only by the Yucca moth, although the clusters of white flowers are visited and favored by butterflies and hummingbirds. 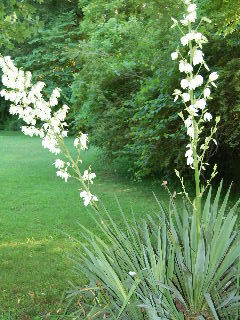 Parts of the yucca plant were believed to be used by the early Native Americans. The fleshy roots of some species were cooked and consumed as a food source. And the extremely tough and fibrous leaves were woven into ropes. One distinctive species of yucca is the Yucca brevifolia commonly known as the Joshua tree. This is an especially attractive plant as it has the appearance of a hybridization between a Saguaro cactus and a flowering palm tree. Given that there are so many species of yucca exhibiting different sizes, forms, and shapes, it’s easy to see why this plant is so popular and so prized by both home gardeners and professional landscapers alike. On a personal note, in addition to the attractive blooms and the unusual sword-like foliage, what this home gardener likes is the low-maintenance/no-maintenance qualities of the yucca. Sunlight, medium fertility soil, and a minimum of moisture and the yucca is good to go!